After years and years of waiting, it has finally arrived: the first ever keyboard with analog functionality. 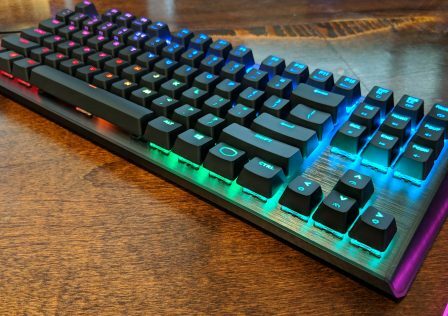 Not only does the Wooting One possess analog functionality for every key, it is also one of the most feature packed mechanical keyboards out there. 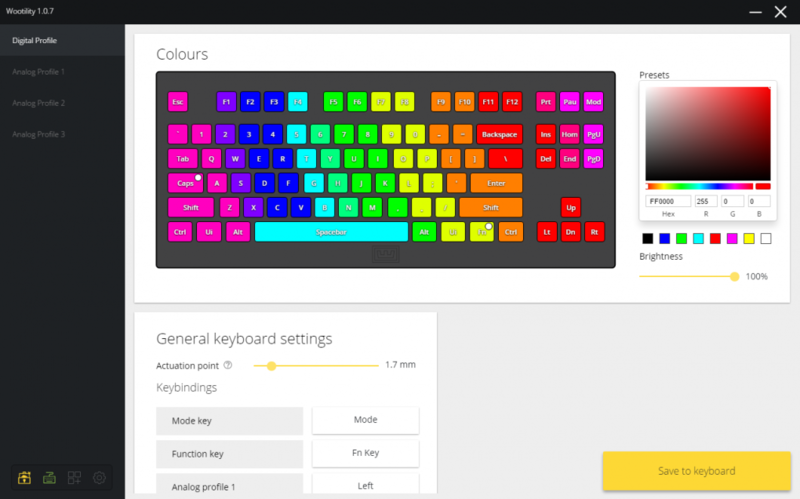 It is a tenkeyless keyboard, available in ISO and ANSI layouts. As expected, due to its unique switches it does not use standard Cherry MX mechanical switches, however it is fully compatible with Cherry MX keycaps! Other features include media keys (not dedicated, but secondary functions via the FN key, but more on this later), hot swappable switches, programmable keys, individual RGB LEDs for each key, swappable plate, detachable USB cable, and a “floating” key design that allows keys to not sit recessed within the keyboard for easy cleaning. 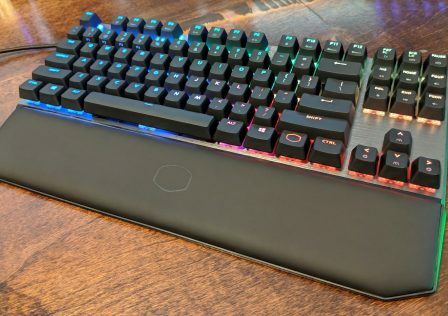 On paper, the Wooting One looks like just about everything one could ask for from a gaming mechanical keyboard, and for the reasonable price of $159.99 for the basic model. 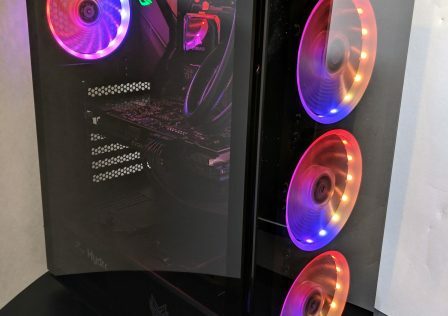 The only difference with the $199.99 premium model is that the premium comes with a complete set of spare switches; Red Flaretech switches installed, and a full set of Blue Flaretech included as well. All of this and more we will go over on the following pages. 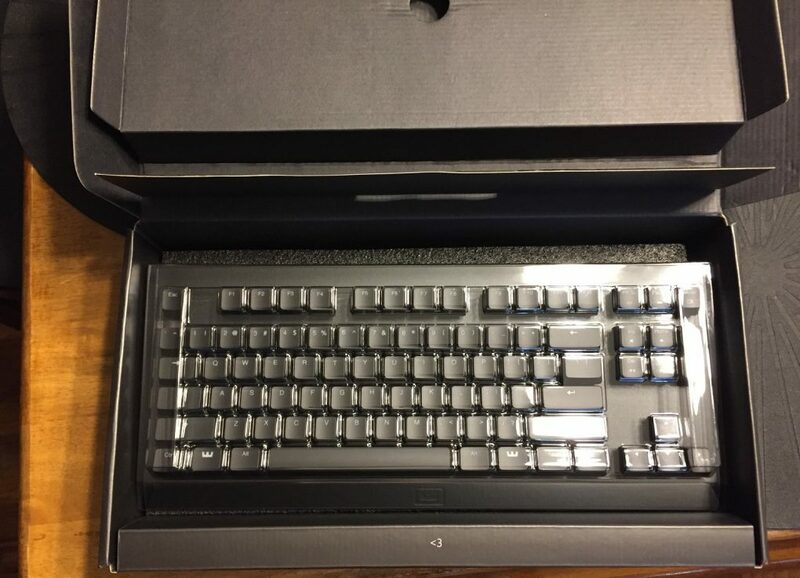 Without wasting much time on what is undoubtedly the least important section of the review, The packaging is straightforward for a keyboard, and includes a clear plastic cover as usual. Inside we see the “First Aid Kit” which are four extra Red Flaretech switches, and four extra Blue Flaretech switches. We also see the manual, detachable sleeved USB cable, and underneath we have a distinct keycap/switch puller. Here is the aforementioned keycap/switch puller. The left side is for pulling keycaps, like any other standard keycap puller (not the wire kind obviously). The right side is for pulling switches, thanks to the hot swappable switch feature. That’s all for the unboxing, now let’s look at the keyboard itself. We will first inspect the physical aspects of the keyboard, and then go into more details about the switches and other features. I had two immediate impressions upon seeing the keyboard for the first time: it looks really nice, and the surface material looks different than the official photos. The Wooting One uses an aluminum plate (steel would be preferable, but again you can make your own and swap it out relatively easily), but it seems they have installed a plastic cover over it on the production model. The Wooting One is surprisingly lightweight. Ducky keyboards seem a bit sturdier, but the build quality here is fine in reality. 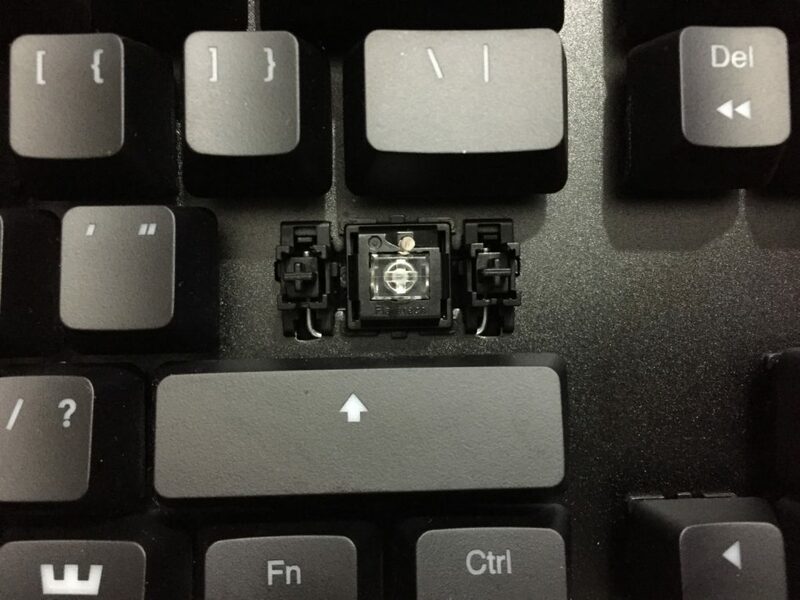 The floating key design is obvious. From an aesthetics point of view, I like it but this varies person to person. From a functionality point of view, this is superior since dust can’t get trapped and it makes it easier to remove keycaps and switches. Speaking of keycaps, they are either laser etched or engraved ABS. They are fully Cherry MX compatible, and I’ve had no issues replacing them with Ducky double shot ABS and Vortex double shot POM+PBT keycaps. 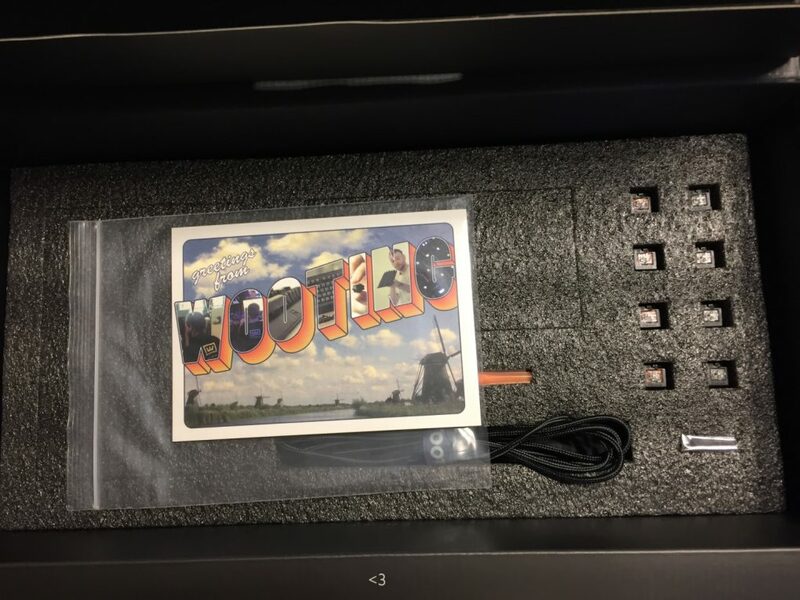 In the photo above you can also see the multimedia functionality as secondary functions on the Insert, Home, Page Up/Down, and other keys in that area. FN + Prt Sc lowers the LED brightness, and FN + Pause raises it. What’s interesting is that you can simply hold down Prt Sc or Pause when doing this, rather than repeatedly tapping it, even when not in analog mode. Lighting is controlled only by the Wootility software which you can download from their website. To switch to analog profiles and back to digital, press Mode (this key has replaced the Scroll Lock key by the way). 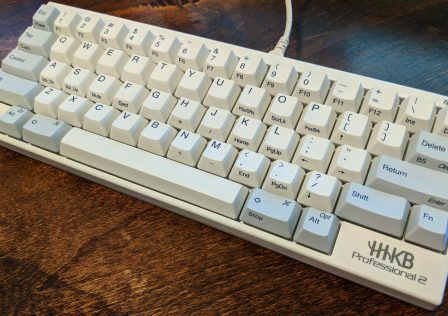 When you switch to analog, you can use the arrow keys to cycle between different analog profiles. Via onboard memory, the Wooting One can store up to 4 profiles—one digital and three analog. The back of the keyboard has standard foldable feet, and four rubber tabs for when not using the feet. 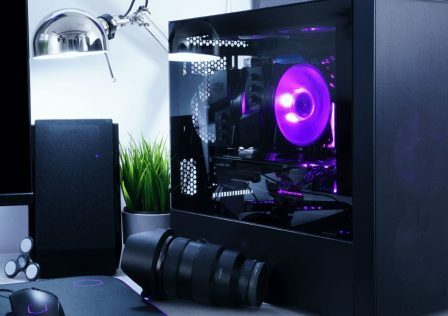 It has built-in cable routing and a mini USB connection. This photo makes it more evident that the Wooting One attracts fingerprints more than other keyboards. Now let’s look at those switches. Currently there are only two models: Red Flaretech and Blue Flaretech. The “Red” and “Blue” designations are used for the sake of familiarity, as Red Flaretech is akin to Cherry MX Red while Blue Flaretech is akin to Cherry MX Blue. I have the Red Flaretech model. Despite the color indicators, these switches are mostly clear. Red Flaretech feels just like Cherry MX Red; light actuation (55cN) and linear. Any differences boil down to the keyboard plate. Blue Flaretech seems to have less tactility and also a different sound than Cherry MX Blue, but the same actuation force as Red Flaretech (55cN). I do not like how Blue Flaretech seems less tactile. Swapping switches requires more pulling force than swapping key caps, but still very little and is easy to do. It is the same concept as using the included puller to simply plop them out, best applied to the top and bottom of the switch I find. The switches, once installed, are rock solid and not wobbly. As expected, the Wooting One uses an equivalent to Cherry stabilizers. Like my previous MK Disco TKL, they do not feel soft or “mushy” like typical Cherry stabilizers. Just a tiny bit softer than Cherry stabilizers or regular small keys without them, and a tiny bit softer than the MK Disco’s stabilizers but hardly noticeable. The fact that they use MX keycap stems is why it retains full Cherry MX keycap compatibility. I just wish they had more switch options; in all honesty, more tactile switches is not very important here since the Wooting One is obviously primarily a gaming keyboard (analog functionality is not useful outside of gaming really). The vast majority of gamers prefer linear switches for gaming, and the Blue Flaretech switches are almost like clicky Cherry MX Browns if anything which seems to be the most popular tactile switch type. I would like to see a stiffer version of the Red Flaretech, called Black Flaretech, taking after Cherry MX Black. The design of these analog sensing Flaretech switches is actually simple. The distinguishing factor is the presence of an IR LED sensor to track the keypress, allowing for analog sensing and, thanks to the Wootility software, customizable actuation point! The simplicity of the design makes me wonder why it took so long for such a keyboard to release, since the technology is old and has been present in controller buttons since the PlayStation 2 at least. Though this technology is far better suited to keys than buttons, since buttons are too tactile and don’t travel enough making them ridiculously hard to control. Not a problem here. 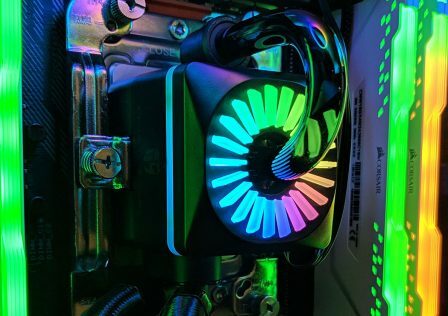 There is an RGB LED under each keycap, and the ‘floating’ key design makes them have a visible underglow as well which I find aesthetically pleasing. The Wooting One possesses no fancy LED modes, just on or off with full control over the colors via the Wootility software. Next we will look at the software and advanced functionality on the Wooting One. Thanks to the presence of onboard memory and the Wootility software, and of course the analog sensing switches, the Wooting One is capable of the following advanced features. Binding XInput and DirectInput functions to keys, also allowing for analog movement in games. Changing the actuation point of the switches. Multiple profiles—three analog and one digital. This is all controlled via the Wootility software, which has a simple design. In some ways, Wootility functionality is limited, but it is expected to be expanded on in the future. It could use more macro functionality, more lighting modes, and one thing I’d really like is the ability to disable the Windows key. One interesting, albeit not very useful feature, is the ability to essentially disable the FN key and make alternate key functionalities the default key function. FN + Home for example lowers Windows volume, but if you enable this feature then just pressing Home will lower Windows volume. Perhaps this is useful for someone who spends long sessions creating content in programs like Audacity. In Wootility, you can select your profiles on the left side. Selecting the profile here automatically sets the profile to the keyboard, as if pressing the keyboard’s Mode key. Changing LED colors is done by setting the desired color and then using the mouse to click keys on the graphical interface of Wootility. This is the digital profile shown above. You can set the actuation point, thanks to the presence of the IR LED sensors on each switch. You can edit key bindings here, but only for the Mode key, Function key, and analog profile keys, unless you enable DKS mode which is currently experimental. DKS is what allows you to set macro key bindings, which are limited to two key strokes per binding. 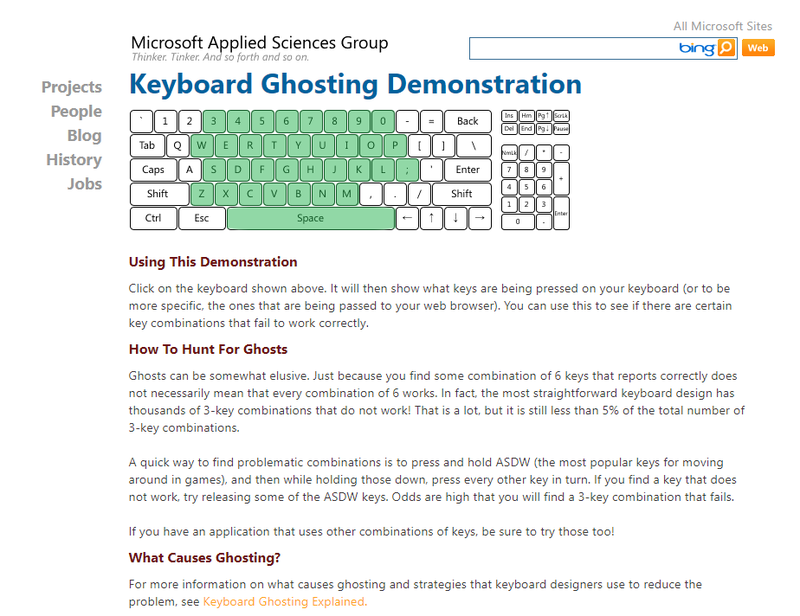 So you can bind two keyboard functions to a single key, and set the actuation point for each. When you select an analog profile, you can bind XInput (Microsoft controller API) or DirectInput (legacy Microsoft controller API) functions to each key. XInput will work with any game that supports controllers, while DirectInput is mostly supported by much older games and also flight simulators. Furthermore you can adjust several advanced gamepad settings as shown in the screenshot below. There is also a setting to enable or disable keyboard functionality within the analog profiles. By default, the first analog profile has the most widespread game compatibility. It only binds Left Analog Stick movement to WASD keys, and keeps all keyboard functions enabled. 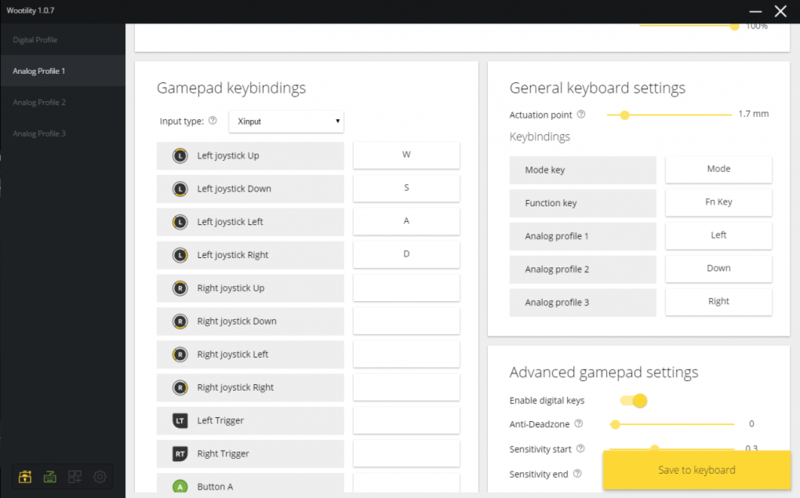 This means you can just unbind WASD keys in any game that supports keyboard and controller at the same time, giving you analog movement on your WASD keys! However, in some games you will also have to unbind the in-game sprint key, and in Wootility bind the XInput (XBOX controller) sprint button to your desired sprint key (usually Left Shift) instead. Analog movement means, for example, pressing W only slightly will move your in-game character/vehicle only slightly forward, while pressing W all the way down moves you at full speed. This is unlike a regular keyboard which only works as if being fully pressed. As you can imagine, this analog functionality is a huge benefit when it comes to controlling vehicles and also movement, so that you can easily walk in games instead of only running (or walk without needing a separate walk key). But does it work as intended? Software bugs are an obvious concern. We will now examine this on the next page! My personal typing speed results and errors are shown in the graph below, compared to other mechanical keyboards. 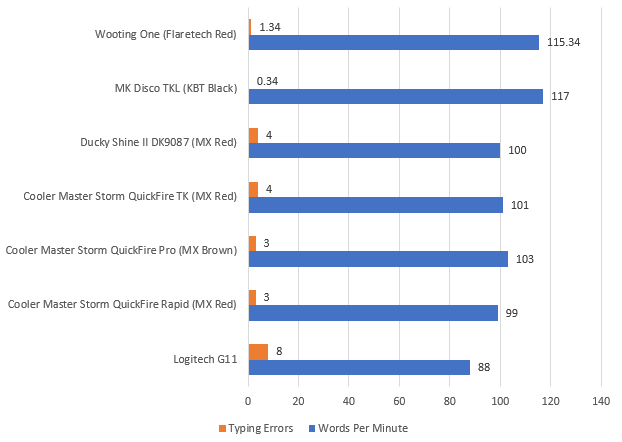 The results are obviously a bit skewed, seeing as how I achieved faster results with fewer errors on the Flaretech Red Wooting One compared to past Cherry MX Red tenkeyless keyboards. 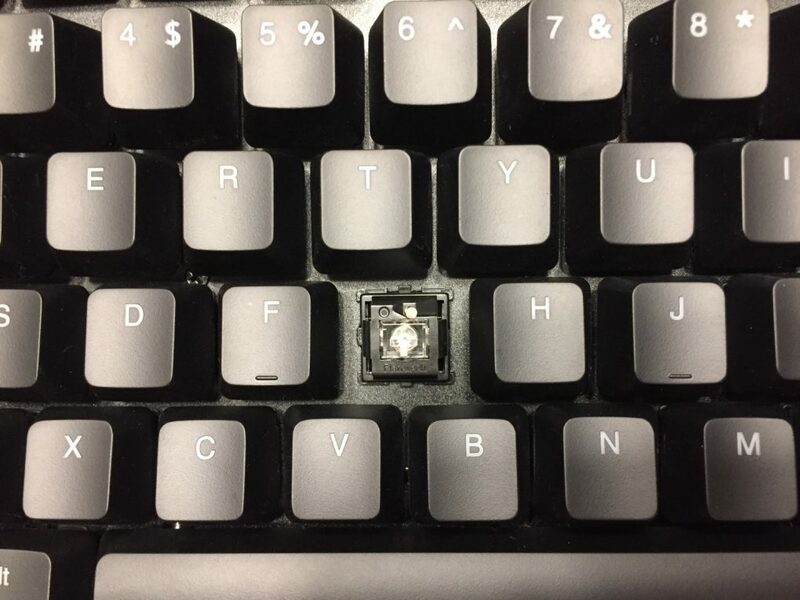 This is not because of anything related to the Wooting One, I’m simply more effective at typing now. 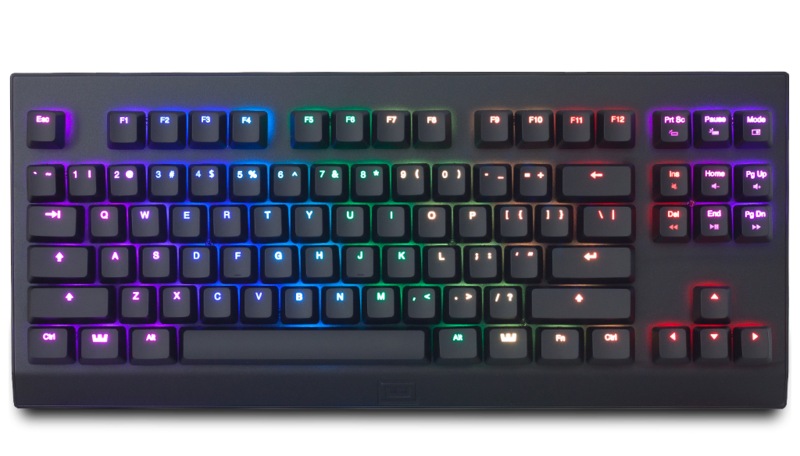 The better comparisons are against the Logitech G11, the only membrane keyboard on this graph, and the MK Disco TKL. The stiffer KBT Black switches on the MK Disco TKL caused me to make fewer errors; the lighter Red Flaretech switches, and also Cherry MX Red switches on other keyboards here, make it easier to create typos by accidentally hitting two keys at once for example. Red switches are light enough so that even a slight press will activate the key, but not so much on KBT Black or Cherry MX Black (or other stiffer mechanical keys). You can also see how much more effective typing is on mechanical keyboards vs non-mechanical, by comparing these keyboards to the Logitech G11. Huge difference. For analog functions to work, the game must support XInput and/or DirectInput as well as keyboards at the same time! Games without controller support will not support the Wooting One’s “analog” functionality, but you can always use it as a regular keyboard. Using an XInput analog profile and unbinding WASD from the in-game options lets me use analog movement on my W, A, S, and D keys. Exactly what I wanted. I can move slowly just by not pressing down W, A, S, or D all the way. But there were a few hitches I discovered in Crysis, in which you cannot strafe in analog mode. I’m not sure if this limitation is a bug in the Wooting One’s firmware, or a limitation of the games in question when using keyboard and controller at the same time (since that’s what games think you’re doing when using the Wooting One in analog mode). I have reached out to Wooting for more insight, and I will update this review when they respond back to me. I could not find a game in my library that supports DirectInput analog stick movement. Emulated console games support it however, as do flight simulators, but you wouldn’t want to use anything but a joystick in a flight simulator. Apart from this, Wootility still has its bugs. My lighting settings stopped saving on Analog Profile #2, though everything else saves properly. The Wooting One is a game changer. I do not want to game without one. Lots of games support XInput, although most 2000s PC games do not, making the Wooting One overkill for those. 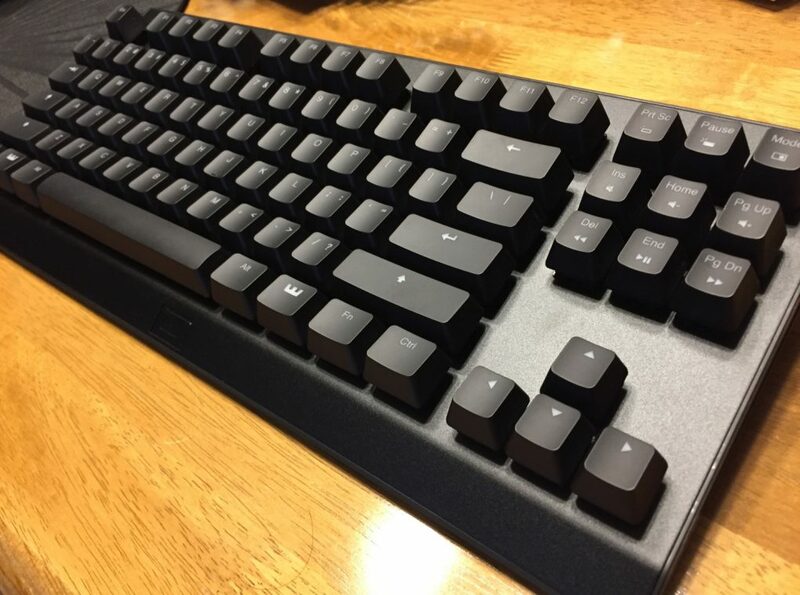 But considering that the Wooting One is a fantastic all around mechanical keyboard, highly customizable and moddable via Cherry MX compatible keycaps, hot swappable switches, swappable plates, and the general excellent physical design of the keyboard (tenkeyless and a flat body so that the keys do not sit under the keyboard), the Wooting One can pretty much do it all. The price is in the premium range, starting at $159.99 and the same number in Europe. I would like to see Wooting offer lower end models that only have IR LED sensors on W, A, S, and D keys. I would also like additional switch options, especially something that resembles Cherry MX Black. Now for the final scoring. Performance: For gaming performance, the Wooting One is objectively superior to all other keyboards thanks to its “analog” functionality via XInput and DirectInput binding. It also supports NKRO, and the fact that the switches are mechanical means typing feedback and thus speed are improved. Hmm… due to the fact that this the first analog mechanical keyboard, it raises the bar here. It gets a 20/20 and I might have to require analog functionality for a keyboard to get this score from now on. What do you guys think? Value: At $159.99 for the basic model, which is what we’re reviewing, the Wooting One is in a premium price bracket for keyboards. Not the Rolls Royce price bracket, more like the Mercedes Benz higher end E class price bracket. Either way, it has no competition since this is the only analog sensing keyboard in the world. Not only that but it has tremendous functionality, even if it could use a bit more. 18/20 with point deductions coming from the fact that the build quality and macro and lighting functionality aren’t the best, but still good. The Wooting One is a game changer.